Once upon a time I was lucky enough to move into a house with a small and completely overgrown garden. So my then-partner and I decided we would reclaim it and try to grow as much of our own food as possible. Just to learn what that would take. We grew some delicious vegetables — and if you know me that will make you laugh — but I deeply enjoyed them after they were cooked. We also had loquats and kumquats and pomegranates. We had fresh eggs from the chickens we also raised up there in the Forgotten Edge, perched between Echo Park and Chinatown. But what we managed to grow? I’m afraid it was nowhere near enough to sustain us and this is partly why (apart from size, as of course that does matter). Grocery stores have brutally erased the agricultural seasons for us, so you have to relearn a lot (which also means your diet and your cooking repertoire have to completely change). You can’t plant seeds all at once, rather you have to do it in waves, so as to have a continuous harvest. Preparation of the ground is key: digging deep, breaking up clay (of which we had tons and it sucked but it sure as hell was better than caliche), adding what you can to improve its lightness along with your organic fertilizer which should come as much as possible from your own compost pile. We aimed for all organic but it was rough, and involved things like wiping down each individual plant to get rid of aphids and other pests. We bought ladybugs, but did not have a garden they seemed to enjoy sticking around in. That required more thought and work and planting. We had to water; to do it efficiently required putting in a drip system or a way to collect rainwater, and treat and reuse gray water, which we investigated but never managed to do. We didn’t have money even for the drip system all at once, so watering regularly was one more thing (though adding mulch reduced that burden). We had to fertilize regularly. We had to tie up our tomatoes and our cucumbers, and insulate our squash from the ground. We had to rotate crops as we constantly planted new ones. Planting certain combinations — like the famous triad of squash, corn, and beans — helps ensure each variety grows better than they would alone and puts them at less risk of pest infestation, so we planned that into our rotations. And every day we had to be out there weeding, watering, tending, planting. Every. Day. All of it required planning and thought and work and more planning. It was joy and pain all mixed together, even if we didn’t do it all that well and I discovered I’m lazier than I thought. I remember reading something in the middle of this that referred to subsistence farmers as unskilled labour, and I almost threw the book across the room. The ability to survive on what you grow on the land is knowledge passed down from generation to generation. To try and relearn it all through books that are never specific to the land you are working? I just wonder when we will awaken to the tragedy of what we have already lost, and what we continue to lose. But more philosophically, it is entirely about getting to know your place: finding out where the sunlight spends most of its time in summer and winter, where the cold air collects, where the soil changes and moisture collects. It’s about acknowledging all of your assets, seeing how you — and everything around you — fit together, work together, improve or help each other. You can only live this way by constantly working to see the world around you holistically, deepening how you understand it. You no longer see just a chicken, but what a chicken eats, how it lives, what it produces as the picture above shows. 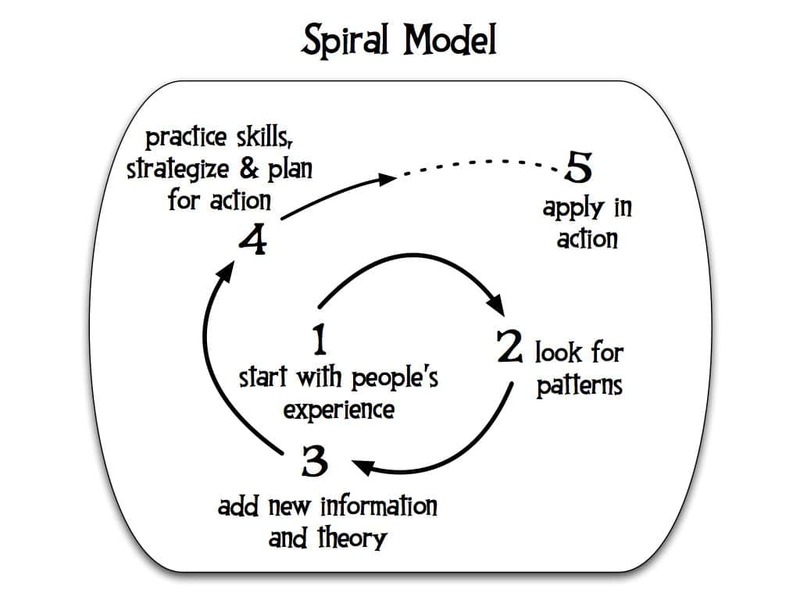 This requires deep reflection on experience, in preparation for acting, building, creating, before reflecting again in a perfect popular education spiral. and the house I grew up, built of adobe by my parents and called at different times ‘mud house’ and ‘nautilus house’. This stuff runs deep.